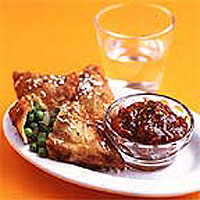 Traditionally, samosas are served hot with a mint or tamarind chutney although they can also be eaten with ketchup and taste very good cold. Amchoor powder, which is made from ground, dried sour mangoes, can be bought from Indian grocery shops and adds a fruity sour flavour. Don't worry if you can't find it - lemon juice is a good alternative. Scrub the potatoes clean, but do not peel. Place in a pan of cold water, bring to the boil, then boil until tender - about 30 minutes. When cooked, drain and, when cool enough to handle, peel and cut into small cubes. Heat the oil in a small saucepan and gently fry the onion, ginger, chilli and cumin seeds until soft and golden. Stir in the the peas and 3 tbsp water. Cover and simmer for about 8 minutes or until tender, stirring occasionally. Remove the lid and boil off any excess water. Stir in the coriander, garam masala and amchoor powder or lemon juice. When the mix is cool enough to handle, mix in the potatoes with your hands, gently crumbling them slightly, before seasoning to taste. Set aside to cool while you make the pastry. Sieve the flour and salt for the pastry into a bowl. Melt the butter and, while still hot, stir it into the flour, followed by 2 tbsp tepid water and enough yoghurt to form a stiff but pliable paste (about 115g). Divide in two: each half will yield six walnut-sized balls. Break off the first ball and roll it in the palm of your hand before lightly dusting with flour and rolling it into a thin disc about 14cm in diameter. Cut in half and place some of the potato and pea filling in one half of the semi-circle. Brush the edges with a little yoghurt and fold over the semi-circle so that it forms a triangle. Firmly seal its edges together, then re-brush with yoghurt and fold over each seam, crimping it down so that it acts as a double-seal. Fill the remaining semi-circle, then repeat the process with the remaining mixture. Preheat the oil in a deep-fat fryer or deep saucepan, to 190C or until a cube of bread dropped into the oil turns golden in about 25 seconds. Cook the samosas in batches, dropping them into the hot oil and frying for 3-4 minutes per batch until golden brown. Drain on kitchen towel and set aside while you continue making the next batch of samosas. Continue until all are finished. Serve hot, garnished, if you like, with dessicated coconut and cumin seeds.